How to play Craps the easy way? 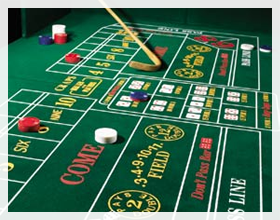 Craps is described by players as one of the most fun and exciting games in any casino in the world. You can see people cheering and shouting when they play craps simply because it is a very exciting game; but sadly the experience is different for players who are not familiar with the game, it is very intimidating and annoying. Craps is not as complicated and not as hard as you think it is. Players from different parts of the world wanted to learn craps but are scared because they have misconceptions regarding the way the game is played. The one thing that you must remember is that if you want to learn and play craps, you must try and be a part of the real game. People are usually intimidated by the shouting, whooping, and hollering of the players who cheer for the person who will throw the dice. This person is called the “shooter”. There are different kinds of bets in the game but the most popular and easiest to understand is the passline bet. It is also the bet with the highest chance of winning. You just need to understand the passline bet in order to play the game the easy way. You start by placing a bet prior to the person who is rolling the dice (that person is the “shooter”). When the dice rolls, for example, a seven or maybe an eleven, you win the bet. However, if the person throwing the dice rolls a different number like 5 or 6, you will lose; and if the first of the rolls is not a 7 or 11 but for example 6, it would be called as point number. The shooter should have to roll again a point number, for example, the number 6 prior to the number 7 is rolled. If the six is rolled (point number) before a 7, you win the bet; but if a 7 is rolled prior to a point number, you will lose. The dice is then passed to another shooter and new come-out roll is determined. If the dice rolls for example a 4, it becomes a point number and the shooter should roll a 4 before rolling a 7 for you to win the bet. It is important not to be overwhelmed by the different bets when you play craps. You must start with the passline bet because it is very simple; and as the game progresses, you will get familiar with the other bets that can be made. The game may look confusing at first but with the right amount of experience, even an amateur can excel in playing craps. Observe the other players and bettors on what they do and where they bet and you will surely learn craps not the hard way but the easy way.